Fruits are unique products, they are beautiful and delicious, and look amazing in the compositions. Fruits are perfect for decorating various dishes, desserts and beverage. Look at the signboards of cafe, restaurants, food courts and their menu, they are full of bright and exquisite food pictures and illustrations, also including fruits. Special attention deserves a popular art of fruit and vegetables carving! Each composition of fruits is a real fruit art! 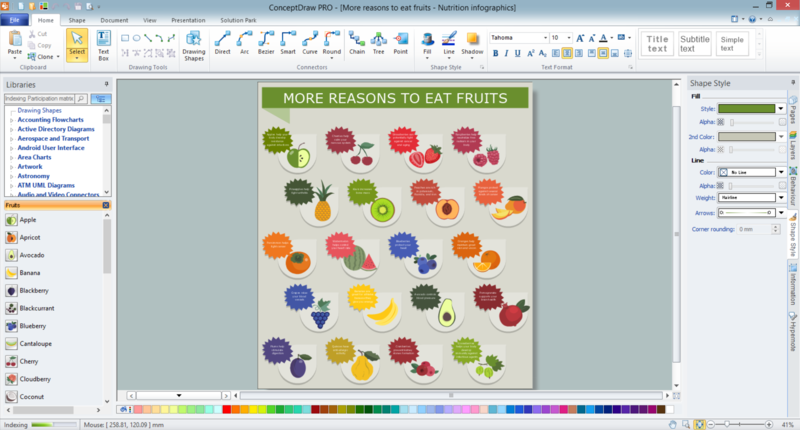 ConceptDraw DIAGRAM diagramming and vector drawing software extended with Food Court solution from the Food and Beverage area of ConceptDraw Solution Park perfectly suits for fruit art design and easy drawing attractive food and beverage illustrations. Food Court Solution contains numerous collection of predesigned vector objects, fruit art examples and samples. 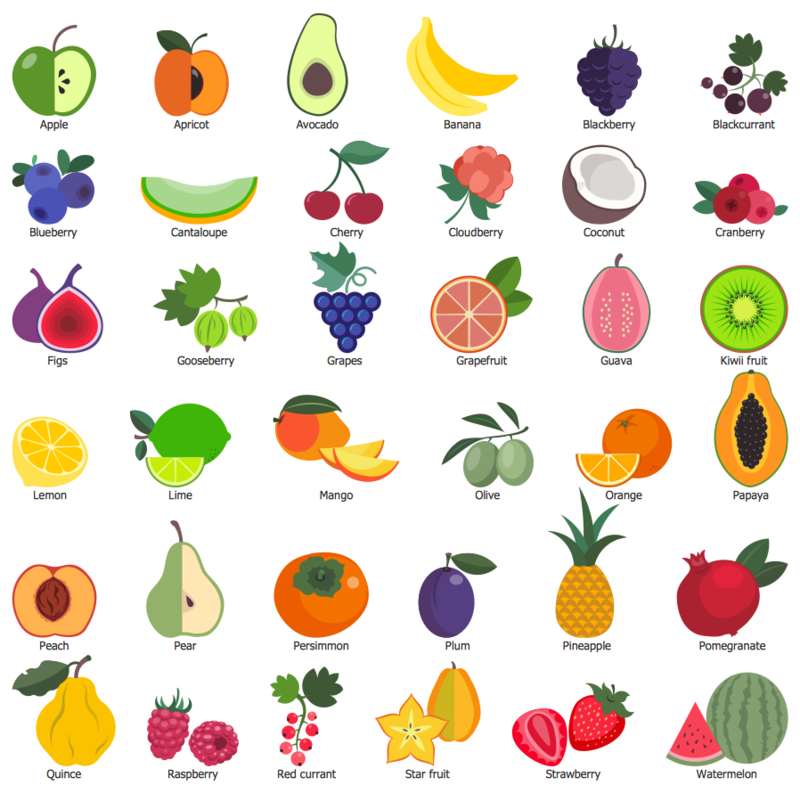 All ready-to-use predesigned fruit objects are grouped in Fruits library which contains 36 clipart. 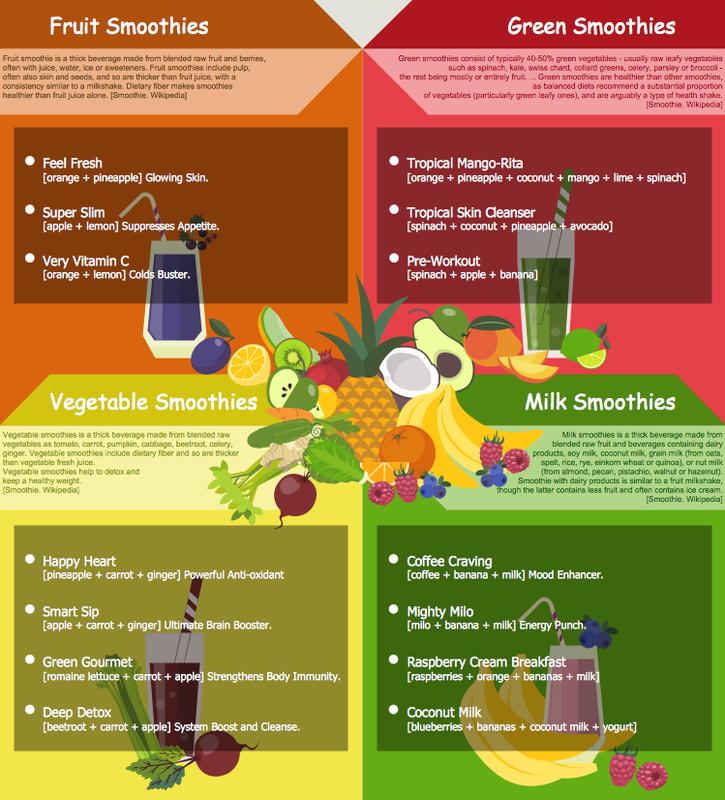 Fruits library is one of 7 libraries included in Food Court solution, the others include vegetables, meat, desserts, drinks clipart, and more other vector objects for drawing pictorial food images. Bright, interesting, colorful and attractive food images and infographics created with ConceptDraw DIAGRAM tools will help you to achieve a great success. Just look at the professionally designed examples and samples in ConceptDraw STORE to make sure this. The fruit art samples you see on this page were created in ConceptDraw DIAGRAM software using the Food Court Solution. An experienced user spent 10-15 minutes creating each of these food samples. Use the predesigned objects from the libraries of Food Court Solution for ConceptDraw DIAGRAM to design your own attractive fruit art images and food pictures quick, easy and effective. All source documents are vector graphic documents. They are available for reviewing, modifying, or converting to a variety of formats (PDF file, MS PowerPoint, MS Visio, and many other graphic formats) from the ConceptDraw STORE. The Food Court Solution is available for all ConceptDraw DIAGRAM users. You need design pictorial food images to decorate menu of your restaurant or to create beautiful advertising materials? We recommend to use a ConceptDraw DIAGRAM v12 diagramming and vector drawing software extended with Food Court solution from the Food and Beverage area of ConceptDraw Solution Park for easy designing colorful food images. High competition among the restaurants at the food court requires original design ideas. To attract visitors and increase sales are used many kinds of advertising products, brightly colored signboards, menus and show-cases, often are used the molds of beautifully decorated dishes. Now designing of colorful F&B (food and beverage) materials is easier than ever thanks to the ConceptDraw DIAGRAM v12 diagramming and vector drawing software extended with Food Court Solution from the Food and Beverage Area of ConceptDraw Solution Park.